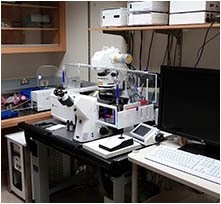 The mission of the Beckman Institute Biological Imaging Facility (BIF) is to provide state of the art microscopy resources that enable Caltech scientists to conduct the most advanced research possible. 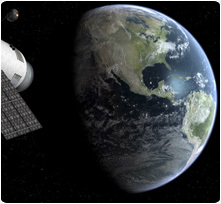 The BIF is supported by the Caltech Beckman Institute and the Arnold and Mabel Beckman Foundation. STATUS UPDATES: All microscopes except spinning disc are working. We now have a second upright LSM 880. 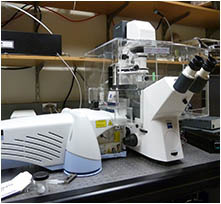 The Biological Imaging Facility (BIF, formerly called the Biological Imaging Center, BIC) is the only core facility on the Caltech campus providing light microscopy resources. We are located in the basement (room B133) of the Caltech Beckman Institute which, together with the Arnold and Mabel Beckman Foundation, support the BIF. The BIF has 9 microscopes. 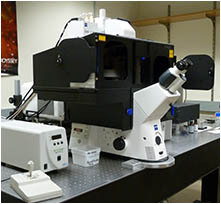 Six are confocal microscopes for optical sectioning of fluorescently labeled samples. 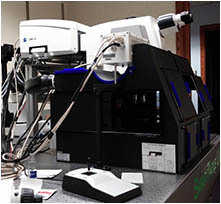 Five are Zeiss laser scanning confocal microscopes (LSMs) and one is a Perkin-Elmer Ultra View Spinning Disc confocal on a Zeiss Microscope. 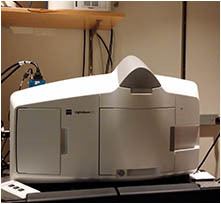 The LSM 880s have the Fast Airyscan module for higher speed and/or super-resolution microscopy as well as providing a higher signal to noise ratio. Three LSMs have multiphoton/two-photon lasers (MP, a category of nonlinear optics, NLO) which allow for deeper imaging of tissues. 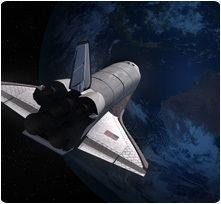 Three have non-descanned detectors (NDDs) for great sensitivity. 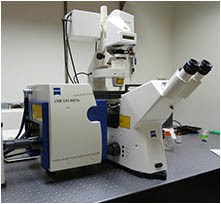 The seventh microscope is a Leica DMI 6000 wide field fluorescence microscope for deconvolution analyses. 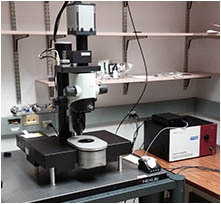 The last two microscopes are Light Sheet Fluorescence Microscopes (LSFM, also called selective/single plane illumination microscope, SPIM) that provide high speed optical sectioning. One is a LaVision Biotec Ultramicroscope II, the other is a Zeiss Z.1. 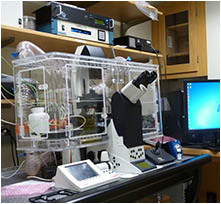 Six microscopes are equipped with incubation chambers for controlling temperature and/or CO2 levels. For more information click on the Microscope tab above. Please go to the Personnel tab above to contact us for training, advice or help with your microscopy. In addition to microscopes, the BIF also provides software resources for processing and analyzing image data. 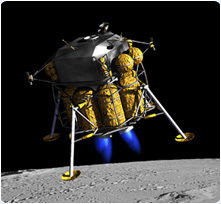 The BIF has two computer workstations running the Imaris 3D/4D image processing and visualization software from Bitplane. We are one of their North American Advanced Imaging Centers, so users are invited to present challenging problems to Bitplane through us. 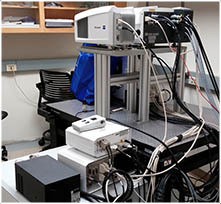 A third computer workstation is running the Linux version of the Huygens software from Scientific Volume Imaging B.V. (SVI), a powerful program for image deconvolution.The BIF works closely with the Director of the Center for Advanced Methods in Biological Image Analysis (CAMBIA), Dr. Alexandre Cunha. There is a natural synergy between the BIF and CAMBIA which work closely to optimize a user’s workflow, beginning with data acquisition and concluding with image processing and analysis. In addition to training on the microscopes, the Biological Imaging Facility offers lecture and laboratory classes (Bi/BE 177 and 227, winter term, class links below) for students, postdocs and staff. If you can not see the Microscope Status crawl above please deactivate Adblocker.